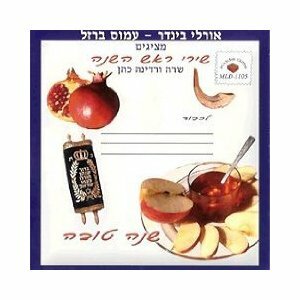 Old favorites and original songs for Rosh Hashana carefully selected for a complete holiday songbook. The songs are arranged in various tempos and styles, with many different instruments, and performed by the well-known Israeli singer Vardina Cohen. This music CD is a must have for your family, with songs that teach about the Jewish holiday traditions and customs: dipping an apple in honey, sending wishes for the New Year, asking for forgiveness on Yom Hakipurim, blowing the Shofar, the names of the months of the Jewish calendar, and more.